RF Radiation Review: How Green is Your Cordless Phone? Do green building practices include low EMF and RF radiation exposures? The answer is usually NO. Green building practices usually do not address EMF and RF exposure and reduction methods. We have a look at the use of DECT cordless phones indoors and the exposure pattern and the desirable elements in cordless phones. Most of us are familiar with indoor environmental quality. But does that also include low EMF and RF environments? This presentation will provide an insight on how a small common household item can have a major impact on our electromagnetic environment inside our buildings. We will review some low emitting or “green” devices which are available. Beginning last year, phones of the DECT 6.0 generation started flooding the US market. DECT is the abbreviation for Digital Enhanced Cordless Telecommunication technology. In the last decade, only Europeans used this technology and were confronted with its headaches. The 2.4 GHz band has been used by the majority of cordless phones in the last five years. However, this band has become crowded with devices such as microwave ovens, wireless area networks (WLAN), Bluetooth, cordless phones and remote control devices. This has led to interference and performance issues so the manufacturers have moved to the 5.8GHz frequency band and the DECT 6.0 technology. The problem with the DECT phones is that the base station is permanently sending (radiating), 24 hours a day, no matter if the system is in use or not. Indoor environmental consultants have rallied against their use for decades. There were so many outcries that it had an impact. Major European manufacturers now offer environmental safer versions, with sleep mode or reduced output in stand by mode. Regulatory maximum exposure limits are set by the FCC (Federal Communication Commission) for cellular providers and OSHA (Occupational Health and Safety Administration) for employee workplace safety. These regulatory exposure threshold limits are high and are solely based on the thermal heating effect of microwave radiation. However, many scientists and research publications have shown that other biological effects exist below the thermal threshold. The question the researchers and physicians are grappling with is if these effects have negative biological effects? Table 1 provides you with an overview of different international regulatory standards and recommended precautionary limits by different entities. About a year ago, an international working group of scientists, researchers and public health policy professionals, The BioInitiative Working Group, has released its report on electromagnetic fields (EMF) and health. It raises serious concerns about the safety of existing public limits that regulate how much EMF is allowable from power lines, cell phones, and many other sources of EMF exposure in daily life. Public health expert and co-editor of the report, Dr. David Carpenter, Director, Institute for Health and the Environment at the University of Albany, New York asserts: “This report stands as a wake-up call that long-term exposure to some kinds of EMF may cause serious health effects. Good public health planning is needed now to prevent cancers and neurological diseases linked to exposure to power lines and other sources of EMF. We need to educate people and our decision-makers that, business as usual, is unacceptable”. The Working Group conducted a comprehensive meta analysis of existing research, and found that a significant number of studies have shown potential effects such as increased and altered cell proliferation, influences on hormones, heart, circulatory, and nervous systems. The Working Group recommends prudent avoidance of excessive EMF’s. Table 2 outlines the suggested exposure guidelines. You can obtain a copy of the BioInitiative Report by downloading it from the following website www.bioinitiative.org . Let’s have a brief look at the development of phone communication equipment and the current state of the industry. We started with the wired phone lines which are disappearing rapidly. This trend is very much supported by the service providers for cost and profit considerations. Table 3 outlines the historical chronology of cordless phones, their technology, frequencies and radiation exposure effect. The problem with many of the current cordless phones is the fact that the base station is sending signals (RF radiation) non-stop, 24 hours a day without being in use (stand-by mode). This effect raises the RF exposure to individuals in buildings significantly. The author purchased four different types of cordless phones currently on the shelves of all major electronic warehouses. Random samples of different technology systems were selected. A spectrum analyzer (Rhode & Schwarz FSH3), a directional logarithmic periodic antenna (Schwarzbeck UKPL 9140) and a high frequency meter (Gigahertz HFW 35C) were used to conduct the testing. Measurements were conducted at about a 3 feet distance (1 meter) from the base station and the handheld devices with the unit in use and in stand-by mode. The following table identifies the technology system, frequencies and the radiation levels. The results show that the 5.8 GHz DSS and analog technologies power the base station off while in stand-by mode and create low exposures during use. Therefore, knowledge of the fields and technology systems are helpful in selecting a cordless phone to create low EMF environments, i.e. a “greener” building. A different type of digital 2.4 GHz cordless phone was placed on a workstation and measurements were made at different distances from the base station with the phone not in use (stand-by mode). A client is concerned about the installation of a new cellular base station to be erected on the roof of a recreation center across the street from their house. The author was asked to assess the home prior to the installation. Table 6 shows the testing results and their sources. The 2,4 GHz was the single source creating high RF radiation in the room. Most of the current DECT 6 and 5.8 GHz phones carry the EPA Energy Star rating. Obviously, this rating is not related to RF emissions. The DECT manufacturers have created two kinds of RF reduction methods for their phones for the European market. The types of phones were introduced to address customer concerns and consumer demand. The German Federal Department for Radiation Safety (Bundesamt für Strahlenschutz) and the Radiation Protection Commission (Strahlenschutzkommission) have the following recommendation criteria for “Low Radiation” labeled phones. Listed below is the EMF/RF rating systems for phones proposed by the German indoor environmental associations. Unfortunately, most indoor environmental consultants in the Untied Sated are not even aware of these EMF and RF issues. With this lack of awareness, manufactures have not been confronted with a demand to provide low RF DECT phones in the US. Our electromagnetic environment has significantly changed over the last decade. New technologies and the wireless world can expose us to unknown quantities of high frequency electromagnetic radiation. 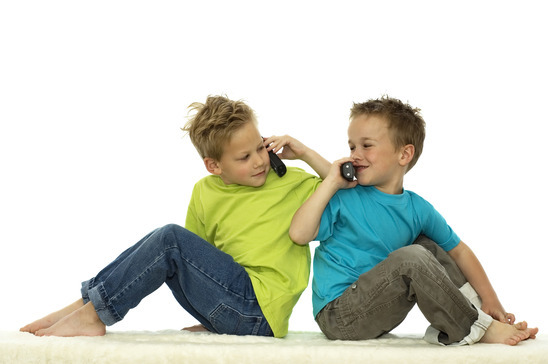 Small household items, such as cordless phones, can become a significant source of RF radiation in indoor environments. The IESO is currently drafting an EMF measurement standard to be published as an ANSI Standard. Therefore, it is important that indoor environmental professionals, IAQA members and the IAQ industry be aware, familiar and able to assist their customers on EMF/RF issues. A “green” building should also be a low EMF/RF building to provide a healthy habitat. Alternative low emission technology is available to replace higher emission devices. These parameters should be part of a “green” building specification and should be evaluated when building-associated illnesses are investigated. If you would like to learn more about detection and shielding of electromagnetic radiation exposure from cordless phones or other devices, call the experts at EMFRF Solutions today at 760-942-9400. Is An iPad Radiation Shield For RF Shielding Effective? Our mission is to provide scientific and unbiased information on electromagnetic fields and radio frequency (RF) radiation, its sources, measurement and evaluation criteria. Our goal is to create healthy and functional indoor environments with low EMF and RF levels through a reasonable and practical approach. Join the EMF & RF Solutions mailing list by adding your email here to stay up-to-date about important EMF & RF news! Copyright © 2005 - 2018 EMF&RF Solutions. All Rights Reserved.